SERVICE CHARGE OF 1.50 PCT PLUS TAX PER STAY. Feel welcome the moment you check-in to DoubleTree by Hilton Hotel Fresno Convention Center with a warm chocolate chip cookie on arrival. The largest full-service hotel in California*s Central Valley we are just across the street from the Fresno Convention and Entertainment Center. Enjoy easy connectivity to Highway 41 Highway 99 California State University and Fresno Yosemite International Airport only 10 minutes* drive away. Discover many retail dining and entertainment opportunities nearby and visit Kings Canyon National Park Sequoia National Park or Yosemite National Park. all within driving distance of our friendly hotel in Fresno California. Feel at home in a stylish guest room equipped with complimentary WiFi an iPod Dock Alarm Clock a 37-inch flat-screen HDTV and a Serta Suite Dreams bed. Upgrade to a suite for more space and amenities ideal for families and extended-stays in Fresno CA. Enjoy breakfast in the relaxed restaurant which also serves delicious American cuisine for lunch and dinner. 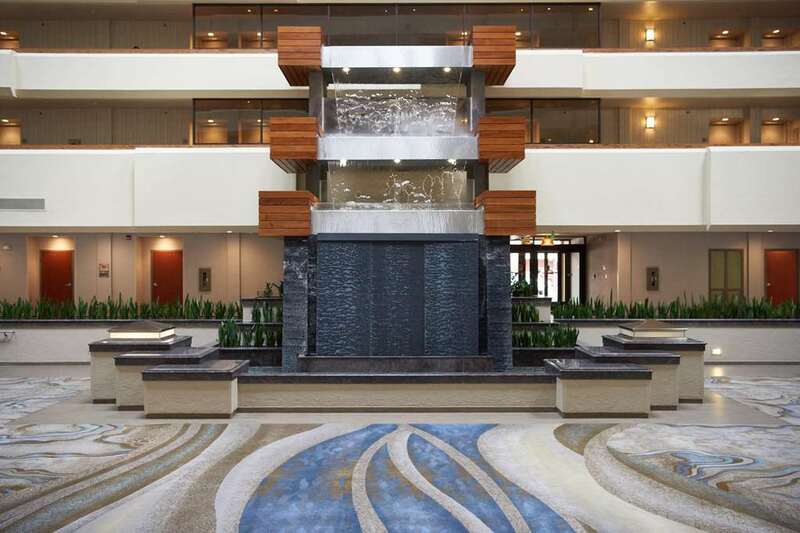 Unwind with a glass of wine as you enjoy views of the cascading waterfall in the atrium Lounge. Java Stop proudly serves Starbucks coffee and a selection of tempting breakfast snacks. With 27 000 sq.ft. flexible meeting space contemporary A/V technology a complimentary 24-hour business center and a dedicated team of event staff. this Fresno CA hotel is perfect for conferences training events and weddings for 10-1400 people. Maintain your exercise routine in the 24-hour fitness center refresh in the heated indoor swimming pool or simply unwind on a comfortable poolside lounger.